Why do human beings produce art? What is art for? To make others happy? To give expression to the artist’s interior life? To make money? These questions swirl about Inside Llewyn Davis, the latest feature from Joel and Ethan Coen. And while they are loath to give a determinate answer — typical for a Coen brothers’ film — they ultimately suggest that one ought not confuse art with the artist. It is a poignant, soulful performance, and Llewyn’s deep-seated sympathy for the material is not lost on Grossman. 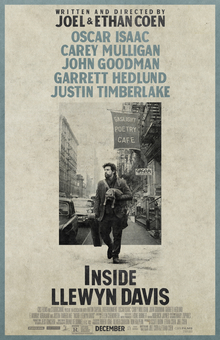 Still, as Grossman sees it, Llewyn’s talent is not suited for commercial success. The art that Llewyn creates is not the sort of thing that others would want to purchase. If anything, it speaks to themes that they’d probably prefer to forget, much like Llewyn himself has been forgotten. Thus Llewyn is brought to a choice: either keep going or give up. And, in raising this problem, the Coens encourage us to consider the nature and purpose of art. Why should Llewyn, the artist, keep creating? It is a question at least as old as Plato, and one that has been treated in a variety of ways since the advent of Christianity. One thought, intimated by the film itself, is that art is simply an articulation of the artist’s psycho-spiritual state. This view has been popular since the Romantics and would seem to align with Llewyn’s rugged and uncompromising individualism. And yet, another thing that the film makes clear is that, despite his pain, Llewyn’s art is attractive. When he sings, something else, something not really intended, also shows up. This is beauty — the beauty of doing something well, of “repeating” the world in poetic form, of allowing the created thing to communicate its truth freely. On this understanding, as Rowan Williams has explained, art is a kind of self-dispossession, a holiness independent of the artist’s moral character. Of course, whether or not the Coens have something like this in mind is hard to say. It is interesting, however, that Llewyn does not write his own material but, rather, serves as a conduit for old folk songs. In him and in his sorrow they speak again, thereby revealing a depth to reality that commercial interests and the vicissitudes of daily life would have us ignore. Love this blog! Will be following…..